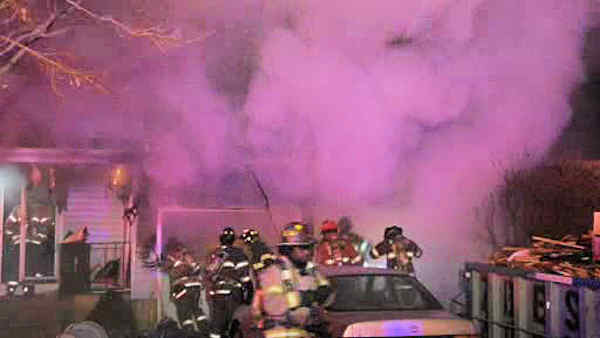 WHEATLEY HEIGHTS (WABC) -- Two police officers driving home an NYPD surgeon rushed into a burning home they spotted on Long Island early Wednesday. The NYPD officers passed by the fire at 146 Ridge Road in Wheatley Heights around 12:15 a.m. The officers made sure no occupants were inside, but then realized there were dogs in the burning home. They were able to rescue all but one dog, which died at the scene. One of the NYPD officers was treated at the hospital for smoke inhalation and released. The officers were driving home a surgeon who had been treating the NYPD detective shot in Brooklyn earlier in the evening.